haha ! Let's "see", so far sounds like he can do it all pretty much...build a suit, replicate the trackway depth, an walk over similar terrain without lookin'...haha ! I can't help wonderin' the excuses he'd come up with when asked to prove all this. I see a couple things. 1) The hand flex would make arm extensions even less probable. You simply cannot produce that effect on a human....by extending the length of the lower-arm. In the early part of the GIF, at about the 8-9 second mark, right before the back and forth segment showing a close up of the buttocks, Patty's right hand either flexes at the wrist or the fingers are flexed at the knuckles. The above combination of details/features on Patty is not reproduceable on a human-in-a-suit.....with, or without 'arm extensions'. Sweaty, the flexing of the hand/wrist shows up much better in your GIF's. It means we have long arms (that are very close to being as long as her legs, which is not a characteristic of humans), with no extensions, fingers that are curled and uncurled, fingers that can bend at the knuckles, a wrist that can flex naturally. I went back and looked at the early part of the Gigantor's GIF and in my earlier post I should have said you can see the hand and fingers bent back "at the end of the second arm swing". In the early portion, Patty only swings her right arm back twice. I've gone back and tried watching Patty's hand/fingers at the end of the first arm swing. It was hard to tell what position her fingers were in since they're against a dark background but they didn't appear to be flexed back and fairly straight with maybe a little curl like they are at the end of the second swing. At the end of the first swing, the fingers almost appear like they might be curled and the hand appears like it may be somewhat clenched. The hand and fingers just seem to look somewhat different at the end of the first arm swing than they do at the end of the second arm swing. I don't want to say for sure that's how the fingers are at the end of the first swing because it's real hard for me to tell. I don't want to be accused of just seeing what I want to see. The wrist bending looks clearer in my animation, Okie....because I used two frames in which Patty's right hand is in very different positions....and appears very clearly, in the frames. You summed-up the features of Patty's arms and hands very nicely, I must say. It looks like Patty has a 'winning combination', in her hands. I'll have to take another look at the animation, for that difference in the curl of the fingers. Later, I can post a couple of images...comparing the fingers in those two 'arm swings'. Thanks Sweaty. It will be interesting to see if there is any difference in the position of the fingers/hand between the first and second arm swings, or if I'm just dreaming. I've even tried watching it a few more times and the fingers still seemed to be curled and not in the same position as in the second arms swing. Although the darker background and with the film running in real time, it makes it hard to tell; even when you know just when to watch closely. Fortunately the image seems fairly sharp. Each one shows the suit beautifully! Nice summary of the problems with costume Bigfoot arms, etc. Sweaty. And, that's an interesting comparison of an ape walking vs an ape jogging above, Daniel. (And, a very cool gif you posted, Gigantor! I can't help it, I guess I'm just leaning slightly towards believing what I see vs believing any of the bloke in a suit babble, to date. Planned walk: For the walk not be planned I guess there would have to be some sort of plan to have the person not just bend forward and do what ever with the arms but there would have to be an effort made to create the walk. Why would a hoaxer plan as walk other than the hunched over walk. It would seem they would be concentrating on maintaining the hunch forward and not falling down. When you ask a person to walk like an ape or whatever like, "imitate a primate" most people I imagine would hunch over a bit and bend their knees a bit. The hunch or bending forward is a no- big- deal effect. Anyone can do that part and might even be expected to do that part. Would someone really make up a walk that has 1) Knocked knees, 2) Bent knees which never seem straight or locked out 3) heel high toward the buttock 4) foot going back somewhat perpendicular to the ground? That seems like a lot of things to come up with in some made up walk. I would think the person would put on the suit and bend forward and walk. Then, they would start walking. That would be about it. If they wished to stay low they would keep their knees bent. Staying low makes sense when a person tends to imitate and ape. It doesn't make sense when a person is trying to convince the viewer the person in the suit is a very tall creature. Why have the person by design squat and lower the height to the viewer? That doesn't really sell. 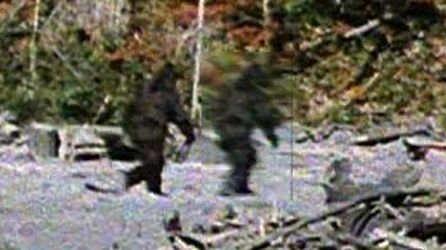 I just doubt the hoaxer wants a man in a suit to make himself look small or short when you are trying to sell a tall unknown creature. 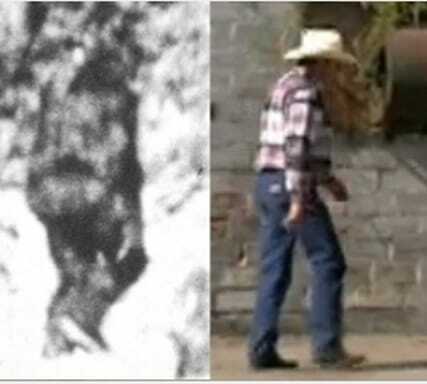 If the suit creates the walk then most other ape suits on video from the 40s, 50s and 60s would share this trait. If not most at least some of them should. For instance, most of us would expect any ape suit has the wearer sweating inside. As it turns out nearly every ape suit is hot inside to the wearer. Shouldn't a Patty-like walk on some level be observed in other suits and movies if the suit itself is what is creating the Patty walk? Backdoc....you absolutely, positively hit the nail squarely on the head. You've perfectly captured all of the unique traits of the walk in a few paragraphs and explained why it would make no sense for a hoaxer to consider, much less employ, those features in a suit. One other possibility is that film subject walks that way naturally. No need for a skilled mime .Then the question remains is it man or beast? I guess anything is possible but I would just feel it would be a stretch to have anyone walk that way naturally. Someone with some birth defect or person who was injured in some accident might be expected to have some quirks to their walk but Patty displays many quirks. Some science lady on TV -I'm not sure who she was- said after viewing the PGF at the end of the show the walk was, "Very odd" or words to that effect. She was the white- haired scientist who described the wilderness as a vast wasteland and Patty would have a large brain and thus had a high food requirement. There are many biomechanical experts on these TV shows and over the years and many others have chimed in. I just don't think I can recall any of them ever suggesting they found a person who might walk this way naturally. It is the walks unusual traits which becomes the focus of these shows because it is so unusual. They might say a person can mimic the walk implying they don't start out walking that way. They are trying to alter their normal walk and through acting create the walk. That is another thing entirely. I have spoken to experts that agree with you. It is a very unusual gait. I have also read that film speed could give the appearance of the unusual walk. I don't really agree or understand that aspect of it. What I do understand is the film subject is still fascinating after all of these years. Man or beast. All hoax theories share the central idea Patty is a man in a suit. Of that skeptic group, there are really only 2 hoax choices: 1) Bob H is Patty 2) Someone other than Bob H was Patty. The best I can remember Bob H claims he did the walk for Roger one time prior to the PGF event. Roger said, "ok that is perfect" after basically watching Bob H do the walk on just one try at Roger's (?) house. We are to believe Bob just tried a walk once. He either did this as a walk made up on the spot ("Hey walk like an ape") or a walk coached by Roger. What are the odds of an untrained Bob or anyone else ending up doing exactly what Roger wanted without a lot of practice/discussion/rehearsal? On top of that, I am not even sure Bob H claims he was wearing the suit during his demo claimed for Roger. I think he claimed to be just in regular street clothes walking inside on a carpet or living room floor. When did Bob H first do the walk? How many times did he do it? Was he wearing the suit when he did? When did Bob H first claim to put on the suit?